If you’re thinking about booking a trip on Norwegian Cruise Line but have been waiting for a little extra motivation, this might be exactly the push you need. Because from now until March 5th, you can book your cruise with a deposit of only $1 per person. They say that nothing in life is free, but $1 deposits might be as close as you’re going to get when it comes to cruising. That said, there are restrictions. For one thing, this offer is only applicable to mini-suite, balcony, oceanview and interior stateroom categories. Translation: Guests wanting to stay in suites, The Haven or concierge level staterooms won’t be able to take advantage of this particular promotion. And while solo guests can book this promotion, they can only do so if paying the full single supplement. Also, each reservation must be made with a guest’s name attached, and already booked passengers who decide to cancel and re-book in order to take advantage of this offer can only do so in accordance with any applicable restrictions which come along with it. 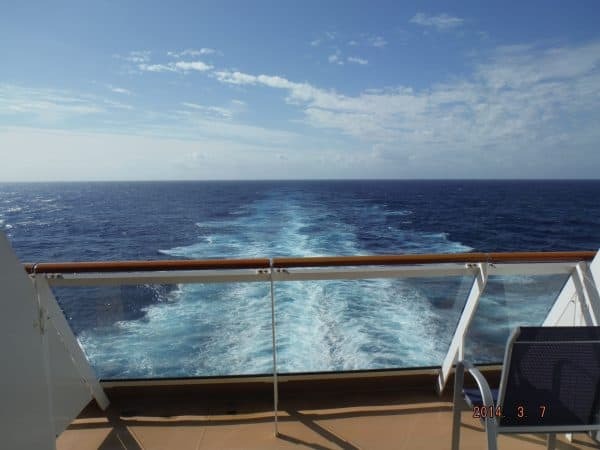 Book an aft-facing balcony like this one on the Norwegian Breakaway for just a buck… and get two perks for doing so. The $1 deposit offer is good fleetwide across all sailings, but again, book quickly as the offer ends on March 5th. (If you want to put it off until literally the last minute, it technically ends at 11:59 p.m. on March 5th!) And yes, those taking advantage of the reduced deposit are still eligible for the Free At Sea promotion which the cruise line runs pretty much year-round. This means that you can pick a number of “perks” based on which category stateroom you book. Do reduced deposits make you more likely to book a cruise?